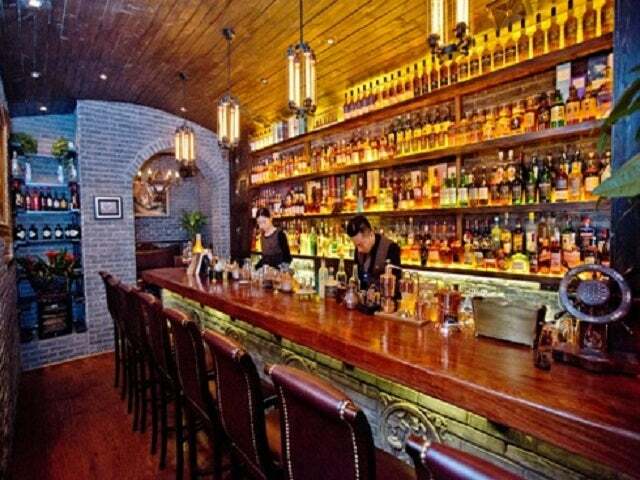 This speakeasy-style bar is pretty tricky to find (which is kind of the point, we know). Make your way into an art store and you’ll find a magic light switch and a sliding antique bookcase. Inside Hidden House you’ll find a magnificent almost castle-like space, all grey bricks and impressionist wall-art. There are plenty of alcoves into which you can tuck yourself with a drink. The cocktails are very good – the work of bartender Xiao Ming, of Revolution and members’ bar Ming, a guy who knows his stuff. The drinks selection isn’t huge, around 20 cocktails in all, but there are several good things to choose from including the Bourbon Mai Tai, which as its name suggests use bourbon instead of the traditional rum. There’s also the zingy London Mule, a lively blend of vodka, fresh ginger, cucumber and lemon juice, and we particularly like the sound of the Silver Gin Fizz which is laced with elderflower and the pretty in pink Secret of Nolita, a drink made from traditional Beijing yogurt, pink vodka, white rum and brown sugar. Service is a huge part of this place’s appeal; it’s attentive, informed and geared towards making the best drinks possible for their customers.